BLOG » How does this work? Like many of you, there's only so much winter gray that I can handle before I turn into Eeyore from Winnie the Pooh. Today's sunny day warmth on my skin makes me reminisce of only a few months back when we were outdoors enjoying the perfect Fall days that our beautiful St. Croix Valley area of Wisconsin gave us. Recently, someone asked me "How do you "see" the end result in your mind, how do you decide what to do with the portraits creatively once they are photographed and why is it important to plan it out?" I'll give you some behind the scenes today to explain the process. I don't always "see" the complete final products, but I have a sense for the look we want to capture to tell each family's story and to make the most of our time together. My goal is to always create portraits that capture a moment of someone's lives and capture it in such a way that it makes them feel emotion, something that will stay in their hearts forever. My long time client Brandy called me last Summer/early Fall to discuss getting her clan in to create something for the wall and her annual holiday cards. Generally, we do in person consultations so I can get a sense of what we are after for decorating their home and my client can get their hands on the different options we offer by seeing and touching things at the studio; it helps the creative process for everyone. Brandy and I have worked together for a few years, I've been to her home on a couple occasions, and I knew she didn't need much direction in dressing her family.. they always look awesome, so we were able to consult over the phone to start. She wasn't exactly sure about a wall portrait, but it wasn't out of the question. Once they arrived and I could see the final outfits, we decided on a sweet location I've got that gives us gorgeous tall grasses, among other things. We always tell parents to keep it light and fun, no stress, no scolding and since these guys know the drill, the session was a blast. The weather was perfect and I grew more and more excited as I was photographing them, because I could see in my mind what we could create after. 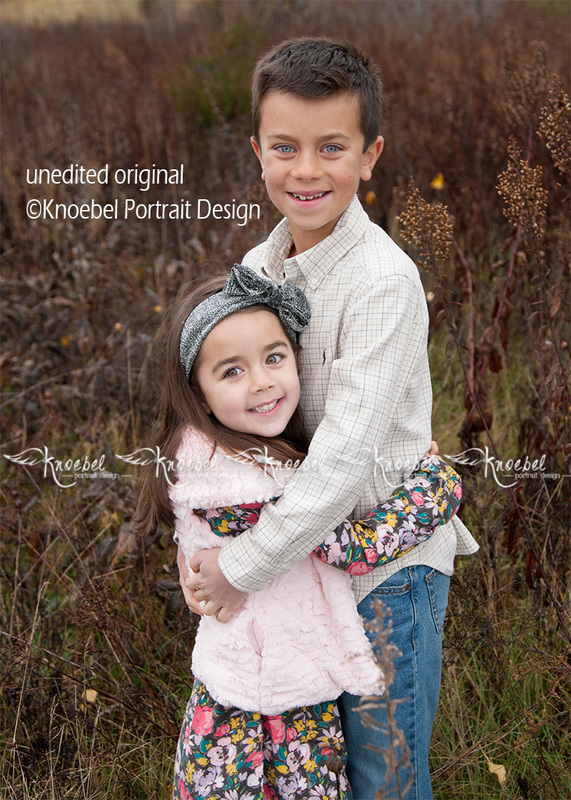 As you can see in this original, unedited image, I don't have much to do to make this more amazing; A. these kids started out cute, B. their mom Brandy dresses them adorably with complimenting colors and tones, and C. they actually, kinda sorta like each other so I could get them to hug easily. If they didn't like each other much, we would have used a different pose to show their relationship more accurately while still using our tricks to get what we wanted, a beautiful expression that mom will love. 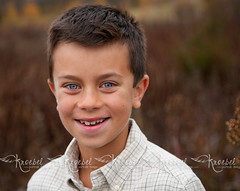 This is a very simple lighting set up with natural outdoor light, a reflector. We always want to enhance the eyes, that is the main focus and what draws a viewer into an image. About a week after her session, Brandy came in for her ordering appointment and after viewing the images for the first time, she agreed, the main image shown below really needed to be on her wall. 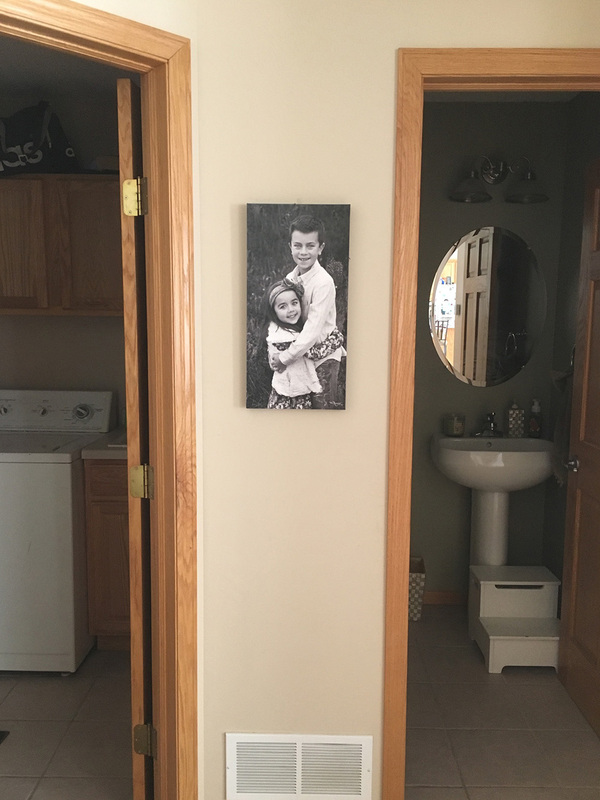 This image lends itself to being a vertical orientation which made it very easy to suggest hanging it in between a doorway or in a spot that she and her family could view it every day. I opted for black and white because their expressions, their eyes, the entire setting is so timeless to me that I felt black and white would portray that the best. It could have gone either way, the colors they are wearing would have worked well with my client's decor, but we both agreed, there is just something about this as black and white; it's timeless, pure, simple, enchanting. This image was cropped slightly, turned into black and white and I enhanced the eyes so they immediately pull you in. Brandy decided to hang it in between her bathroom and laundry room (see below), a place where it will be viewed and enjoyed every single day, multiple times per day. Her only regret, she told me recently, was that she wishes she would have gone a little bit bigger... which is often the case. 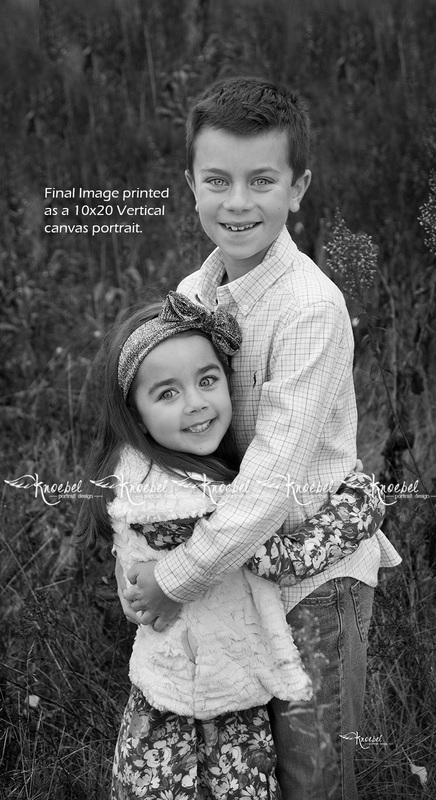 The key is, if you want portraits that make your heart melt every time you see them, utilizing a professional photographer (one that actually carries business insurance) and proper planning is a must. If we hadn't planned this out, and I didn't know what I was doing, they could have shown up in clothes that didn't work together, my client would have felt frazzled and our entire session wouldn't have gone as smoothly as it did. When you think about the years of enjoyment you will get from a portrait that captures your children in this way, the time, effort and money you spend is well worth your investment. I'd love to hear your questions or comments whether you are looking for a photographer or you are a photographer trying to build your knowledge and business.